Cloud data centres bring valuable services that many of us are progressively accepting into our daily lives – and in doing so, push optical communication’s limits. ‘The premier league cloud data centres have this tremendous appetite for more bandwidth,’ comments Andy Bechtolsheim, chief development officer at Arista Networks in Santa Clara, US. They expect their bandwidth needs to double every two years or so, he says. ‘400G is the best way to deliver that kind of bandwidth cost-effectively,’ he adds. Annual global cloud traffic is set to exceed 14 zettabytes by 2020, Mark Nowell, distinguished engineer at Cisco in Ottawa, Canada wrote in a company blog in January. He calls that ‘astounding’ considering that the world only reached one zettabyte a couple of years ago. Consequently, 400Gb/s Ethernet systems are currently being built and tested featuring eight 50Gbit/s optical channels. These systems follow specifications such as the Octal Small Form Factor Pluggable (OSFP) or Quad Small Form Factor – Double Density (QSFP-DD). The good news is that board SERDES and optical SERDES don’t have to match. ‘For the first generation of 400Gb/s Ethernet based on 100Gb/s lambda, you would have this eight-lane electrical interface, which is called 400GAUI-8,’ Nowell says. ‘This is still the ASIC based on 50Gb/s SERDES. Then a “gearbox” chip translates from eight lanes down to four. Consequently, Finisar introduced 400G-LR8 and 400G-FR8 transceivers with 10km and 2km reaches respectively, using the eight-lane QSFP-DD form factor at the OFC conference in San Diego, US in March. Yet at the same time it introduced a serial 100G-FR QSFP28 form factor transceiver with a 2km reach. Finisar also plans to introduce a 500m reach 100GDR version of this module, which Koehler underlines will interlink the 400 Gb/s Ethernet and 100G serial offerings. Koehler also stresses that Finisar’s 50Gb/s and 100Gb/s lanes use PAM4 encoding, instead of the traditional non-return-to-zero (NRZ) format, which he sees as crucial in meeting bandwidth demands. The PAM4 modulation scheme doubles the bit rate without increasing the baud rate, by using four signal levels instead of two, he says. The Arista executive acknowledges the challenges in developing components for an all-100G serial ecosystem, on the electrical and optical side. ‘It is clear that there is demand for 100G lambda optics starting in 2019 and for merchant switch chips with 100G SERDES as soon as they can be built,’ Bechtolsheim says. To help advance 100G serial readiness, the MSA that Nowell leads conducted a private ‘plugfest’ where firms compared equipment with each other this summer. The MSA plans to follow that up with a public interoperability demonstration at an industry show this Autumn. ‘Companies feel that their solutions are ready to be tested,’ Nowell says. 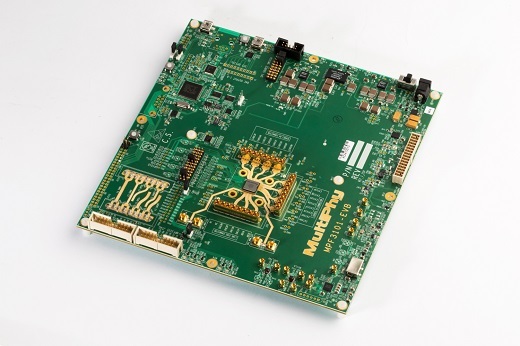 Israel-based Multiphy develops 100Gb/s digital-signal-processing (DSP) based integrated circuits that support PAM4 modulation schemes. ‘We’ve very much been focused on developing the 100G serial technology and implementing it in the silicon and DSP,’ CEO Avi Shabtai says. ‘Our work was showing that this is possible, and that you can create an ecosystem, and then also making sure that it gets to mainstream standardisation.’ He’s therefore pleased to see companies ‘marching into 100Gb/s and 400Gb/s Ethernet’, the IEEE standards and the 100Gb/s lambda MSA. That indicates cost structure convergence, Shabtai asserts, which would make building modules with a single optical path much cheaper. Costs may be below $1 per Gb/s of optical link capacity, he feels. ‘Once you move to serial interconnect and you have native 100Gb/s, it’s much easier to increase the density of the ports.’ Modules should also be more efficient in power consumption, he adds. MultiPhy’s approach to supporting the technology in the short term is moving from 25Gb/s to 50Gb/s electrical SERDES. ‘We face the challenges of driving 100Gb/s on a single optical path by applying very unique patented signal processing technology,’ Shabtai says. This helps module makers relax optical component requirements, particularly important for 100G serial.